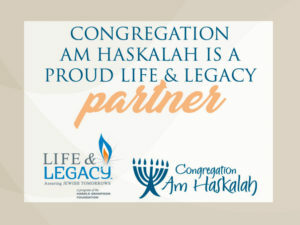 Whether you come to services every month or every Kol Nidre, you know that Am Haskalah is here for you in times of celebration and struggle. That’s why we ask you to step up and support our community. Those Israelites who could, donated additional t’rumah to support their community; if you are able to donate above our set dues amount, your additional contributions will be used to help support our learning, social action and programming. Donations may be made in honor or memory of a loved one or to celebrate a life event. Option #2 – Use our secure Paypal link (you can use a credit card if you don’t have a Paypal account) The Paypal donation link will be available from the Donation Info Confirmation page. Please note, Paypal deducts funds from your donation to pay for the service. Whether you choose to use Option #1 or #2, please tell us about your donation so that we can properly allocate the funds.